Mr. Movie: A look at the Bat-mobile and its different appearances on the big screen. 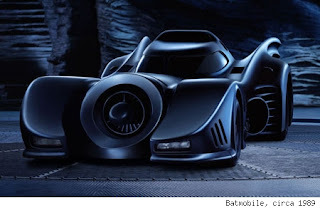 A look at the Bat-mobile and its different appearances on the big screen. Christopher Nolan has just revealed the title, casting and villains of the upcoming Batman movie, this has gotten fan’s excited and I’ll admit I’m pretty hipped myself, so I thought it would be fun to post something Batman related. A lot of fan’s have been interested to know who the new villains are or if Robin will be in this film, and while all that is interesting, I’m more excited about what the new Bat-Mobile will look like. In my opinion it’s the coolest vehicle in cinema. Why, can’t say, maybe because it’s the most famous superhero vehicle, maybe for its many different appearances on screen, well, it’s just awesome so I thought it would be fun to look at the different versions from all 8 of the theatrical Batman movies. Bat-Mobile shown in the 1966 film “Batman The Movie”. 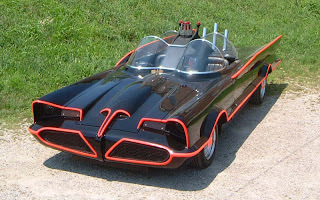 This was the first portrayal of the Bat-mobile on the big screen and yes, it looks like a toy car that wheeled its way out of “Chucky Cheese” but for the time it was really impressive. There’s a bonus feature on the DVD called “The Batmobile Revealed” hosted by the vehicles creator George Barris. It’s pretty cool how he talks about how he came up with the design of the car and how he points out little details in the vehicle that are hard to notice during the film. This batmobile is nostalgic for its time but it’s not as cool as most of the more modern bat-mobiles. Bat-Mobile shown in the 1989 movie “Batman” and the 1992 movie “Batman Returns”. This is my favorite version by far and it’s the first one that comes to mind when I think Bat-mobile. It had such a slick and dangerous look, almost like a missile on wheels. Also, it’s not to over the top with bat wings or bat features, it’s just right. I’m not shore why it needs that big circle-fan in the middle but other than that, this bat-mobile will always stand as the classic Batman vehicle. 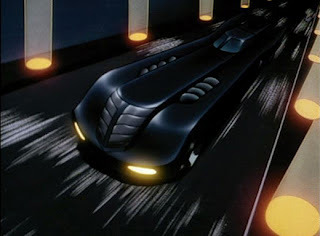 Bat-mobile shown in the 1993 movie “Batman Mask of the Phantasm”. I probably shouldn’t even count this one because it’s an animated car and it was shown for a full 3 seconds in the film. Never the less, I found it necessary because it’s my second favorite design of the Batmobile. This one’s smooth and slick, it doesn’t have a big circle in front and it bears a resemblance to the original when it had its shields up. Unfortunately, it has less of a bat feature but that doesn’t ruin what is otherwise an awesome looking vehicle. There’s also one note worthy moment when Bruce Wayne goes to a place that’s a carnival /blue print to what a future Gotham City will look like. One of the future cars on display gets his attention and it has the same design of the Bat mobile. It’s always fun to see where the Bat-mobile originated from, a concept that will be built on in another batman movie that will be mentioned latter. In comparison to the last two batmoblies, this one looks a little silly but to be honest it still feels like a classic bat-vehicle. I had a toy version of this car, this version has also been on display at theme parks and it’s the version shown in comedies like “Lonnie Tunes Back in Action” and the resent "Arthur" remake. This one’s smaller, has more of a bat design and has a little more screen time than most of the bat vehicles. It doesn’t have the same subtle feel of the animated one or the cool, dangerous feel of the Tim Burton one but it’s still a good vehicle all the same. 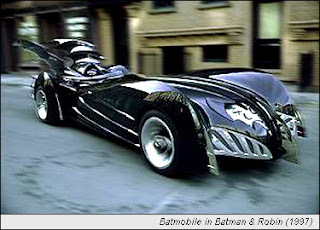 Bat-mobile shown in the 1997 movie “Batman and Robin”. What can be said about this one, well, it’s definitely one of the weakest of the bat-vehicles and it looks like one of those toy cars that break apart and then are reassembled into robot fighters. 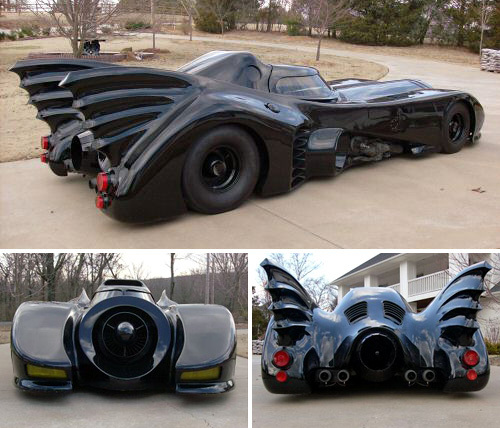 To be honest, I think it has too much unnecessary stuff built on it, I mean, come on, dose the bat mobile need that much useless stuff covering it. Well it may not be that great but at least I can call it a batmobile, unlike the next one. Bat-mobile (Tumbler) shown in the 2005 movie “Batman Begins” and the 2008 movie “The Dark Knight”. At last we get to the newest (and worst) Bat-mobile, well, bat-tank or bat-war van are more appropriate titles. I’ve had my up’s and downs with all the previous cars but the one thing that can be said for all of them is that they are all bat-mobiles. 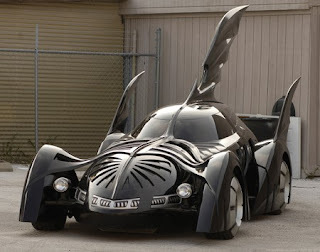 This thing is so over done and so distant from the rest that it’s stupid to label it as a bat-mobile. To be fare, I liked how Bruce Wayne actually bought this car from someone else and just painted it black, as opposed to creating something so technically advanced on his own. Having said that, I don’t think batman needs something this big, loud and destructive. If you hadn’t seen either of these movies (“Batman Begins” or “The Dark Knight”) and just saw a picture of this vehicle, you probably wouldn’t connect it to Batman at all, you’d just think it’s a battle van. 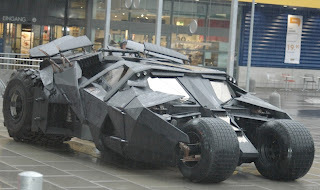 Fortunately, the Tumbler was destroyed in the last film and that’s what leads me to the main reason of this post, what’s the new Bat-mobile going to be like in the next film. Well, here’s what I think, in the first season of the 2004 TV show “The Batman”, he had a bat mobile that was also very big, just with a tint of blue. But in season 3 that vehicle was destroyed and replaced with one that looked more like the classic animated one and that’s what I hope they do in the next film, give us a Bat-mobile that’s slick, subtle and can be labeled as a Bat-mobile.